QB–Jagayra Gomes, Clark; Jennifer Haberstock, Green Valley; Nayeli Silva-Kahalewai, Durango; Katie Mulligan, Silverado. RB–Mariyan Muhammad, Sierra Vista; Deborah Grant, Green Valley; Tatianna Baes, Durango; Kennedy Power, Silverado. 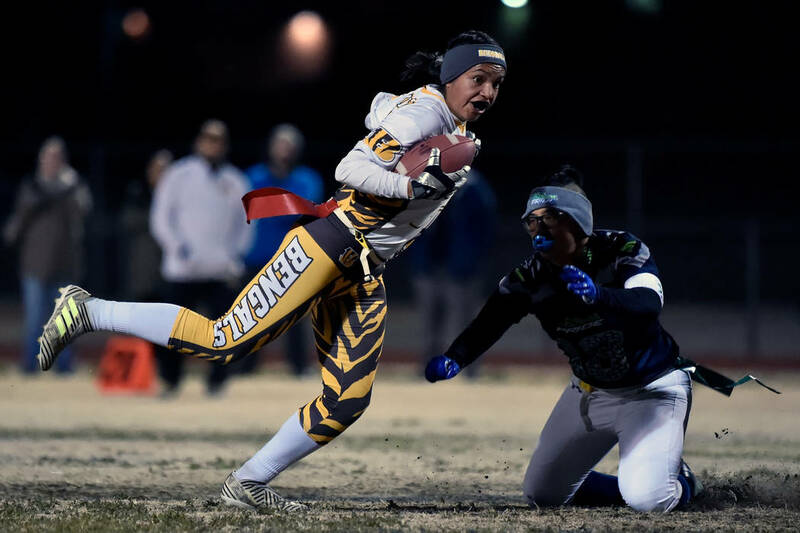 WR–Jamie Kalaau-Sunia, Sierra Vista; Brianna Miller, Sierra Vista; Reagan Raimer, Coronado; Whitley Brow, Foothill; Jazlyn Camacho, Green Valley; Gabriela Corchado, Durango; Brielen Aquino, Silverado; Jaeda Centeno, Clark. OL–Madison Bennett, Tech; Teresa Ruvalcaba, Clark. LB–Hannah Serquina, Green Valley; Jayla Kalaau-Sunia, Sierra Vista; Jovanna Quinones, Clark; Payton Bard, Coronado; Amanda Burt, Coronado; Jianna Kurtz, Foothill; Anna Marie Arce, Green Valley; Lilliana Perez, Durango; Sidney Bishop, Silverado; Amarachi Adiele, Silverado. DB–Samantha Malley, Clark; Lexie Potts, Coronado; Niyah King, Foothill; Rebecca Orozco, Green Valley; Hailee McKay, Green Valley; Gabrielle DeGuzman, Tech; Chloe Dody, Tech. QB–Jalyn Joule, Legacy; Tiarra Del Rosario, Cimarron-Memorial; Cindylou Rasiang, Bonanza; Mikayla Brown, Shadow Ridge. RB–Brinkley McCoy, Las Vegas; Charlene Beck, Bonanza; Samantha Guerra, Shadow Ridge; Neveah Wilkins-Johnson-Desert Pines. WR–Mikaela Nunez, Legacy; Ashley Vasquez, Bonanza; Mya’Liah Bethea, Cimarron-Memorial; Shayne Dunn, Bonanza; Denae Benites, Centennial; Natasha Obradovic, Cimarron-Memorial; Alicia Kestner, Bonanza; Dina Lee, Cimarron-Memorial. OL–Jordyn Williams, Legacy; Abigail Zuhlke, Shadow Ridge.